The Byte CII North American Championship will be held July 13 & 14 at the Sail Newport Sailing Center in Newport, RI, as part of the Newport Regatta. Sail Newport is also hosting the Byte CII World Championship from August 24 – 28. A fast and fun singlehanded one-design dinghy, the Byte CII is built by Zim Sailing, headquartered in Warren, RI. It measures 12 feet long, weighs 100 pounds and has a 64 square foot, fully battened mylar sail on a two-piece carbon fiber mast. It’s designed for sailors weighing between 100 and 165 pounds, with an ideal race weight range of 135 to 155. US Sailing’s Chubb Junior Championship will be held August 5 – 9 in LaPorte, TX. The 2013 US Women’s Singlehanded Championship is September 13 – 15 in Brielle, NJ. 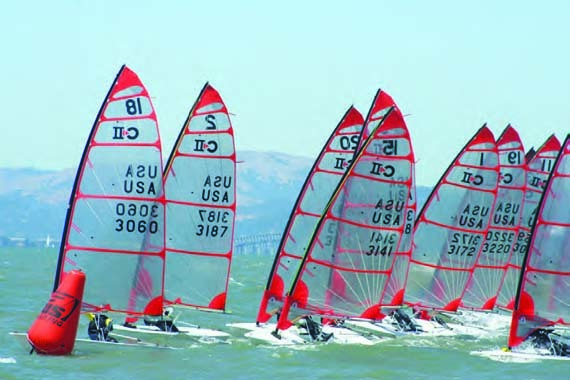 The USA Team Selection Regatta will be sailed in May 2014 at a yet-to-be-determined venue in New Jersey, and the next Youth Olympic Games are scheduled for August 16 – 28, 2014 in Nanjing, China. In addition to the Byte CII, Zim Sailing builds the standard Byte (designed for sailors outgrowing the Optimist, it shares a hull with the CII but has a smaller rig), the Farr-designed Megabyte, and various Optimists, 420s and FJs. For more information, including how you can participate in any of these events, visit zimsailing.com.